The Turkish military have announced that they have deposed President Erdogan and are running the country. People started reporting a military presence in Ankara about an hour ago and the closure of bridges across the Bosphorus. Tanks are on the streets and helicopters and jets are patrolling the airspace above the city. Skirmishes between the police and army have been reported whilst the police guarding the presidential palace are said to have been disarmed. Facebook, Twitter and YouTube have been blocked in the country. 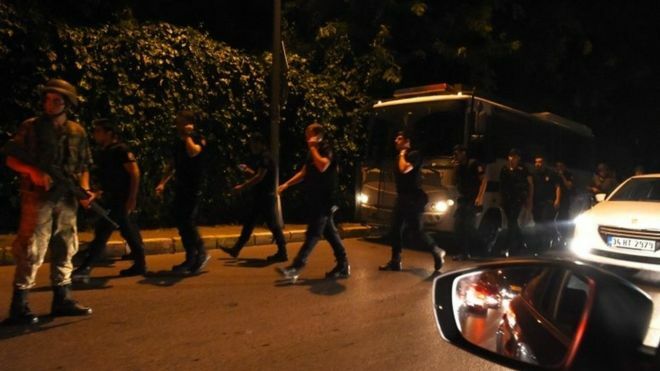 The Turkish Prime Minister denied there had been a coup shortly before the military's announcement. The coup appears to have been successful and Erdogan is reported to have left the country in his private jet. Major airports are closed, TRT (the Turkish equivalent of the BBC) has been taken over by the military and a curfew has been imposed.